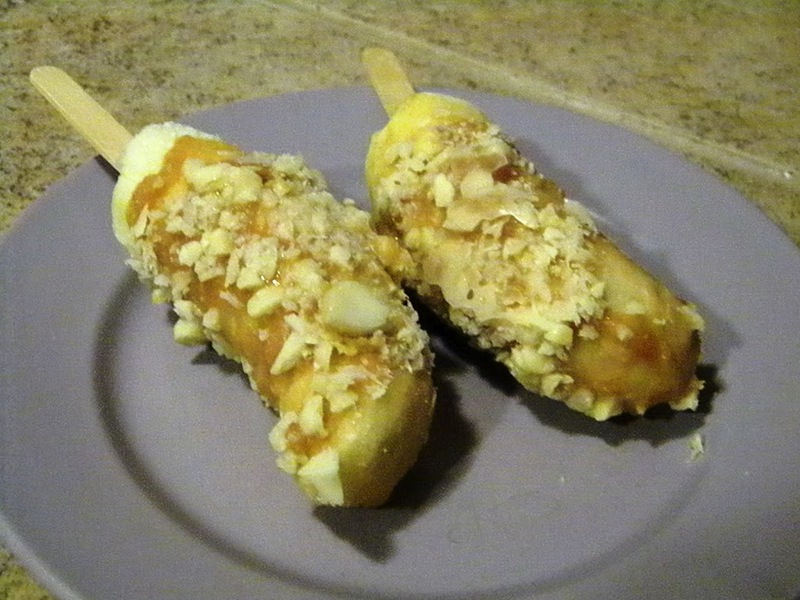 Well I started out to make this I meant for them to vanilla coated frozen bananas based on the candy recipe I used to make peanut butter cups a while ago. I made a little mistake, but it turned out to be a good one – I had my pot a little too high, and I carmelized the butter and the coconut butter by mistake. So instead I ended up with a caramel coating. Cut bananas in half. Insert a popsicle stick in the bottom of each one and freeze for a few hours. Once bananas are frozen, prepare the coating. Place nuts on parchment paper – spread out so you can roll the banana in them. Heat a small sauce pan over medium heat. Place butter and pan and heat until melted and just starting to brown. Stir in the rest of the ingredients except for the nuts. Stir quickly until everything is melted together and golden brown. Coat the bananas in the sauce then roll in the nuts. I placed them on a jumbo baking cup to freeze. Freeze for several hours until coating is solid and bananas are frozen again. This looks good! I might have to try it out next time I want a dessert. ok wow totally making this asap!